We all have found ourselves at one time or another in a position where we have done something wrong to someone we love. We spend years building friendships, marriages and relationships and sometimes one single act destroys all of our effort. When we are offended, we feel justified in our anger and hurt but we rarely know what to do and how to handle being the person who offends someone else. Everyone handles it in different ways, some of us go into hiding while others lash out and cause a scene in order to mask their embarrassment. When we have offended and hurt someone, we can feel immobilized and plagued with guilt and shame. Running away isn’t the solution. The best solution is to reconcile. Fixing our interpersonal relationships is important to God. 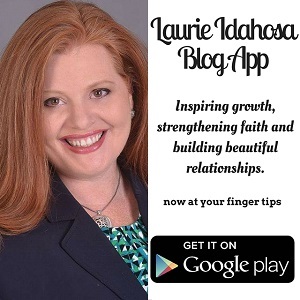 Repairing relationships also helps us live in an environment that is healthy for us emotionally and spiritually. In fact, it is so important that the Bible even advises us not to give an offering to God if we have offended someone. Here are 7 steps you can take which will put you and your relationship on the much-needed pathway of healing. 1. Accept responsibility and render a sincere apology. 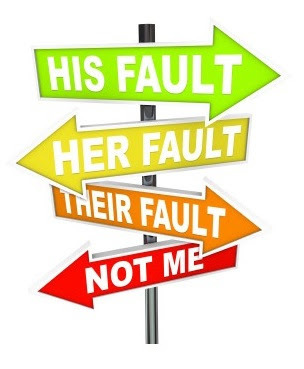 Avoid the trap of sharing the blame for your actions with the person you've offended. This isn't the time to bring up all the reasons why they drove you to do what you did. This is the time to be humble, sincere, accept responsibility for what you have done and apologize with a genuine heart. This may also be good time to fess up if there are other things you have done which the person may not be aware of yet. Since you are starting the pathway of healing, you may as well heal fully instead of putting a bandage on a wound that is infected. Finding out that there were more layers of offense after the relationship has started recovering can cause a fatal blow. A sincere apology does not say, "I'm sorry, but..." it simply says, "I acknowledge what I have done wrong to you and I am sorry." 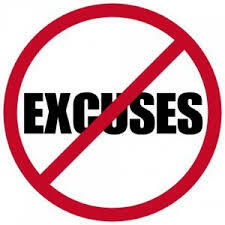 Making excuses for your wrong action is not an apology. Your tone of voice, body language and sincerity all play a very big role in rendering an apology. Ensure that you are sincere before you say "sorry." This approach of confession and apology is found in the Bible. Note: Some wrong actions are also illegal actions. 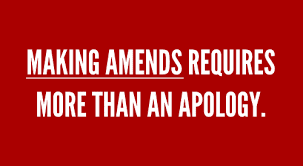 If you are rendering an apology for something you did which could have legal consequences, you may wish to get advice / legal counsel before you do it in a way that can have lasting implications. 2. Don't foolishly compound the issue with other issues. Face what you have done head on. This isn't the time to throw others under the bus just to take the spotlight off of yourself. You will be tempted to want to defend your wrongdoings by exposing the wrongs of others. There's a tendency we have that when we are in trouble, we drag others down with us. This is why it is so easy for a criminal under interrogation to name the other people who helped him commit the crime. Nobody wants to go down alone. We also tend to avoid confronting what we have done wrong by creating diversions. We intentionally take something someone has said to us out of context and make an issue out of it, just to avoid the sting of the present situation. Don’t take the easy way out; allow the situation to sting, take the pain so that your healing can begin. We have a great example of the necessity to make amends in the tax-collector, Zaccheaus. He had offended an entire community with his embezzlement of funds and corrupt manner of carrying out his duty. Jesus forgave him and embraced him, but, he knew he had to make things right with the people he had hurt.
" Jesus entered Jericho and made his way through the town. 2 There was a man there named Zacchaeus. He was the chief tax collector in the region, and he had become very rich. 3 He tried to get a look at Jesus, but he was too short to see over the crowd. 4 So he ran ahead and climbed a sycamore-fig tree beside the road, for Jesus was going to pass that way. 9 Jesus responded, “Salvation has come to this home today, for this man has shown himself to be a true son of Abraham. " The townspeople were hurt by what Zaccheaus had done. They needed restitution if they were to forgive and accept him. There are some offenses you commit that will require you to pay back the person you have offended. If this is the case, come to a mutually agreeable restitution plan and abide by it, no matter how inconvenient it is. Having a repentant heart, full of humility in making amends will aid the person you've offended in their path towards forgiveness. Please note that just because someone has forgiven you, it doesn't mean that you don't still need to make some form of restitution. You should accept that there may be repercussions for your actions. In II Samuel, we read a story that would make for an intriguing motion picture full of love, seduction, scandal, murder and retribution. It's the story of David and Bathsheba. When David impregnated Bathsheba and had her husband Uriah sent to battle to be killed, he had to suffer the consequences of his sin. His son died and his family life thereafter was laced with dysfunction. When we repent of our sins, we are forgiven by God. 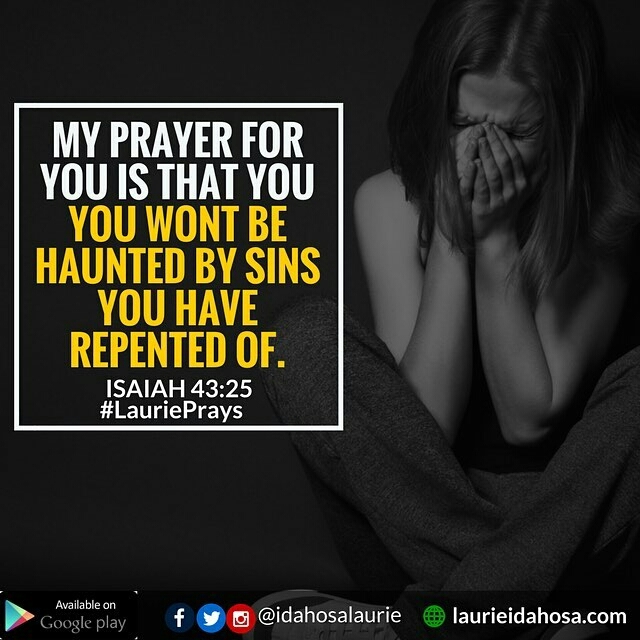 Isaiah 43:25 says, "I, even I, am he who blots out your transgressions, for my own sake, and remembers your sins no more." God doesn't remember our wrongs, however, we live in a society where there are laws that govern us. When you have broken a law, you may still face the penalty of that action. There are many people around the world who have felt deep remorse for their sins and are forgiven by God but are still in prison. God's forgiveness doesn't negate the laws of the land. You will need to take your time to deliberately plan exactly how you will rebuild your trust and regain your reputation with the person you've offended. 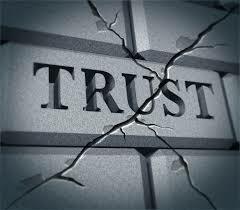 Good behavior is key to rebuilding trust. You can't consider yourself on a path to regaining trust if you continue doing the same thing that created the grievance in the first place. Give trust time to rebuild. For some it may take years, decades or a lifetime. My Dad, Dr. Gary Whetstone calls it, "Extracting the Gold from Life's Crisis." There is a lesson to be learned inside of every crisis, including the ones that occur because of your wrong actions. 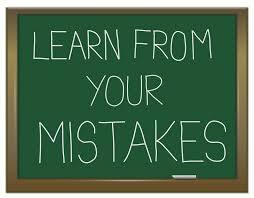 What you learn from your mistake can make you a better person. In order for this to happen, there must be a strong swallowing of pride and willingness to be teachable. "Beat your plowshares into swords, and your pruning hooks into spears: let the weak say, I am strong." Don't miss out on the huge opportunity your mistake has brought before you. You can be a better person after this crisis wanes if you manage the situation well. There's no sense in going through something if you're not willing to analyze it properly and see how you can grow from it. There is also nothing worse than finding yourself apologizing for the same behavior again and again in different scenarios and possibly with different people. Sometimes, forgiving ourselves is the hardest part. It is hard most especially when you are truly repentant and feel like you deserve to feel bad for what you've done. When we have made a mistake, we tend to feel better when we hang our heads low in shame, at least for a little while. "Just think how much more the blood of Christ will purify our consciences from sinful deeds so that we can worship the living God. For by the power of the eternal Spirit, Christ offered himself to God as a perfect sacrifice for our sins." Jeremiah 31:34 (NLT) says, "...And I will forgive their wickedness and I will never again remember their sins." 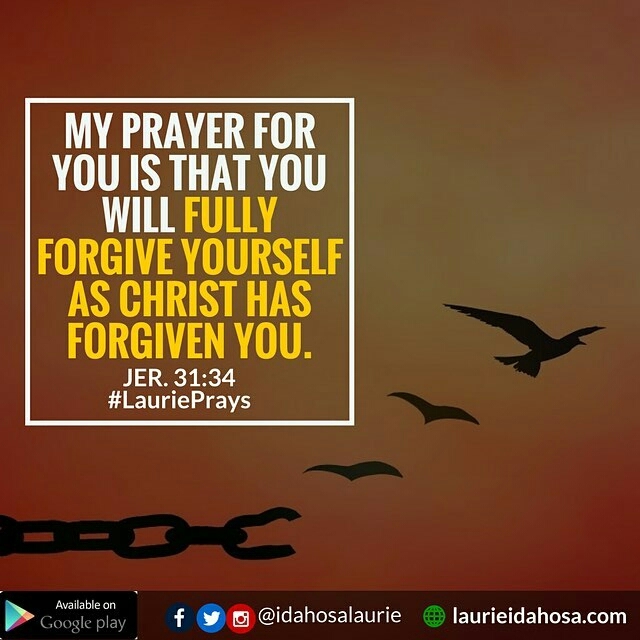 If God has for forgiven us and forgotten our mistakes, we ought to give ourselves that same grace and mercy. May God give you the Grace to see His love at work in you, despite your sins and mistakes. May you experience the revelation knowledge of His Righteousness and walk in the truth of the power of the cross. Once we understand that we have been forgiven when we didn't deserve it, it makes it easier to forgive others and ourselves. 7. It's okay to feel remorseful, but, your mistake must not define you. The Apostle Paul is one of the best examples in all of history of someone who didn't allow the gross errors of his past to define him. He was a violent man who tore families apart by targeting and murdering Christians. He must have had thousands of people cursing him because of his heartless acts of persecution and killing. If anyone had cause to be eternally ashamed it is him. However, that wasn't the case. Once he repented and gave his life to Christ, he never looked back at his mistakes or wretched lifestyle again. He went on to write 2/3 of the New Testament and was one of the most influential men in all of Christendom. 16 So we have stopped evaluating others from a human point of view. At one time we thought of Christ merely from a human point of view. How differently we know him now!17 This means that anyone who belongs to Christ has become a new person. The old life is gone; a new life has begun! 18 And all of this is a gift from God, who brought us back to himself through Christ. And God has given us this task of reconciling people to him. We must acknowledge the finished work of Jesus Christ and walk in the fullness of the freedom that He paid for. We can not look at the errors of yesterday and believe that they will control our tomorrow. If you read this article to the end, I believe that you now have very practical ways to make things right with someone you have offended. There is no better day than today to start on the pathway to healing. I'd love to hear from you as you apply these principles. Let me know how they worked and share some of your own methods other than these that you have found to be useful. You are in my prayers. You will get through this! My first time to read your blog. This is fabulous! I love this article! But in the multitude of counselors there is safety. I thought I was doing that but even in the church among leadership you must seek Godly Wisdom when it comes to sharing personal information about someone. I pray that God will one day restore our friendship for His Glory In Jesus Name!